Here is my new and improved "No Bunny Bag Topper" for 2014! Of course, you are still welcome to use any of the other older versions if you like. 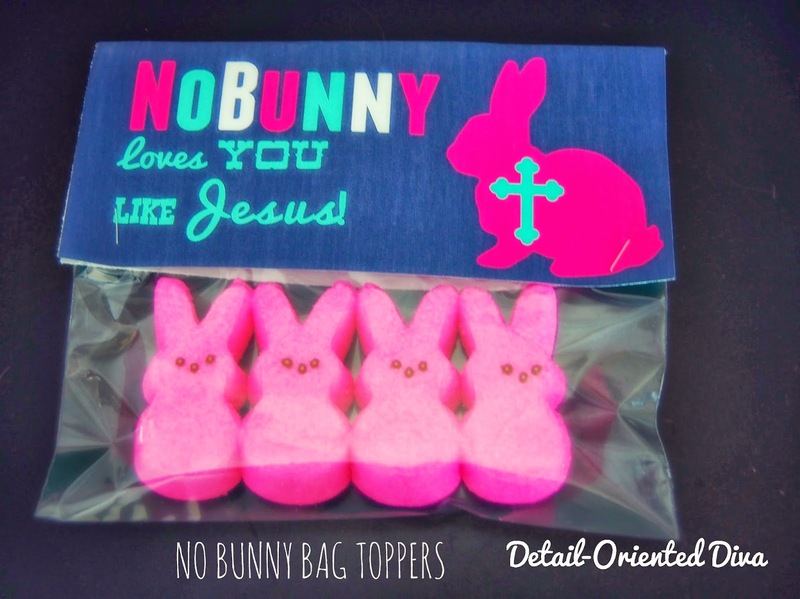 These make great Sunday School gifts, class gifts, and Easter basket fillers. They even make great witnessing tools and conversation starters for sharing your faith in Jesus Christ. Just put some bunny peeps in a quart-size ziploc bag. You don't have to use Peeps - fill it up with any kind of bunny creation. Once you have your bunnies in the bag, seal the bag and roll it down so the bunnies won't shift so much. Next, print out your cards and trim. Then attach the card to some card stock to make a fold-over card. Once your card is assembled, just fold over your bag and staple at both bottom corners. Thank you so for these! This is my second year using them as a little treat for my kids at church. They always love them and the parents do as well! You are so very talented! !